Most of the Guaymies are farmers. But as the jungle's soil isn't very fertile, no food can be sold. They even have to buy additional food sometimes. Unfortunately, there is no possibility to earn money in the reserve. 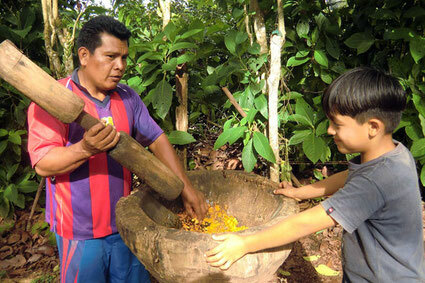 Therefore, the Guaymie men have to look for a job outside of the reserve. Due to this, their wives and children sometimes have to wait two weeks until they see their father/husbands again. An alternative would be that the whole family works on a coffee plantation for a few months. But the work on a plantation is very exerting and even when it's raining they have to work all day long. This work helps them to earn enough money, so that they are able to live again at home for a few months.